Transforming Chinese Medicinal Ingredients and Safe Application： Traditional Chinese medicines, either collected in the wild or grown in naturally fertilized soils, are free of problems related to pesticides and heavy metal contamination. China’s heavy use of pesticides and chemical fertilizers in medicinal herb cultivation has left that country with severe problems in terms of residual organ chlorides and heavy metals such as lead, arsenic, cadmium and mercury. Also, grown in open soils populated by potentially dangerous microorganisms, oversights in handling and processing of harvested materials can easily lead to microbial or fungal contamination, which pose real threats to human health and safety. Most manufacturers of Chinese medicine concentrates in Taiwan grind crude herb powder directly into powder, then add starch to add 20% or more to product weight. This leaves high levels of pesticide and heavy metal residues and exposes products to significant microbial contamination risks, leading to potential molding and the production of aflatoxins and other dangerous toxic byproducts. Toxins introduced via such vectors into the pharmaceutical product stream find their way into our bodies, causing severe problems for human health. Shenfoong Co., Ltd., recognizing these ubiquitous problems, was established in 1989 with the specific mission to develop genuine Chinese medicine concentrates that do not contain crude herb powders. 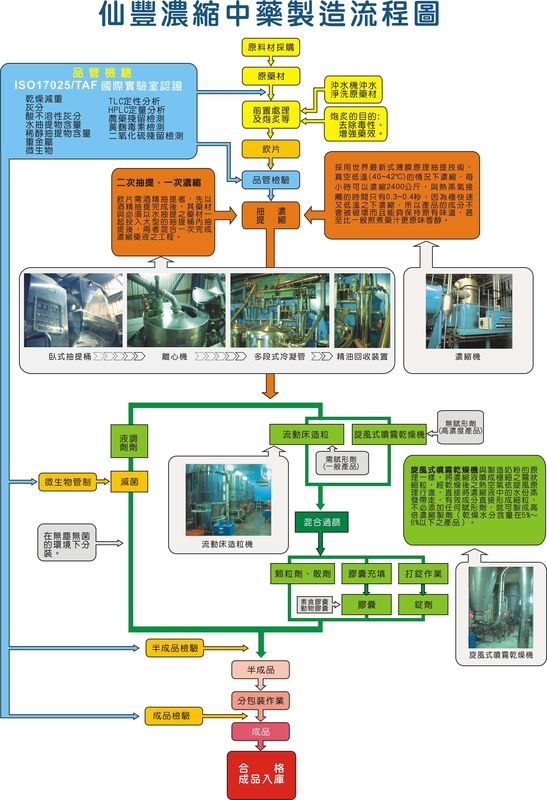 We use leading world production technologies to develop Chinese medicines in highly concentrated form and guarantee all our products meet E.P., U.S.P. and J.P. quality standards.